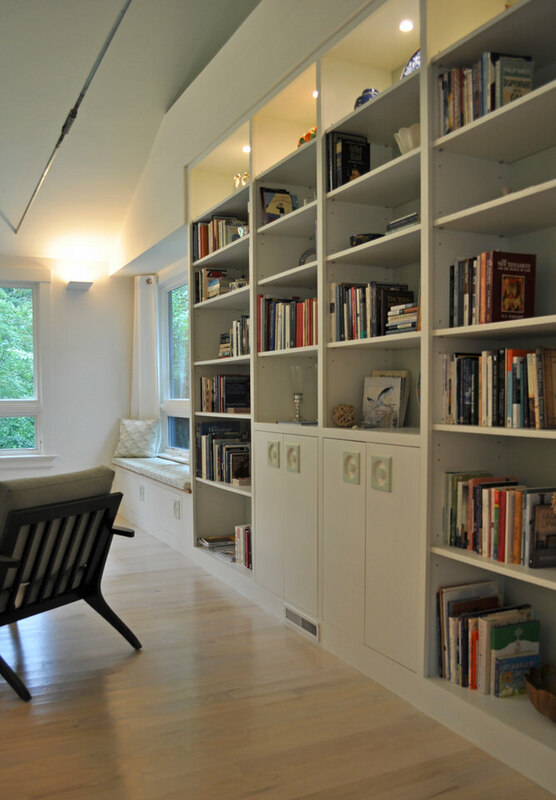 You may have seen the article in The New York Times this week about built-ins and how they can save space, provide versatility, and help organize. Plus, they’re fun. Here are a few built-ins I’ve designed for KHS projects. My client at the Wenham Ranch House knew that her desk would likely be cluttered, so she wanted a way to quickly conceal it when she wasn’t using it. Our solution was to tuck the built-in desktop, chair, and overhead shelves in a closet with a pair of bi-fold doors. 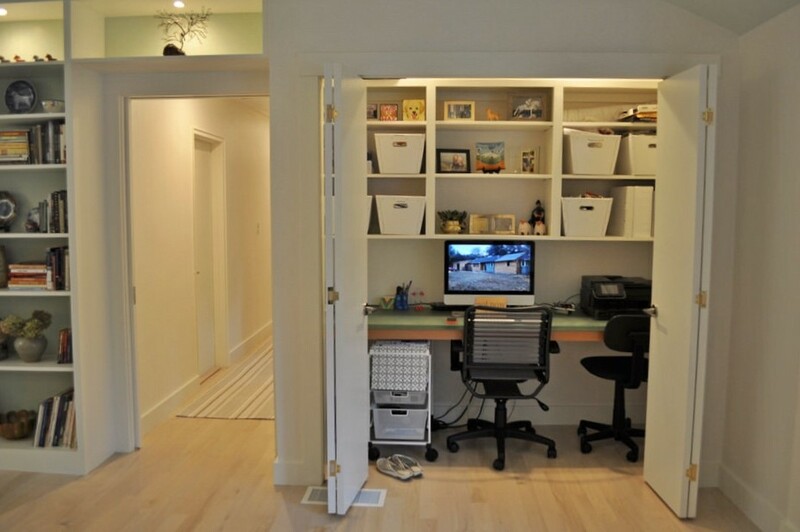 The large door opening allows the desk space to feel generous when the doors are fully open. 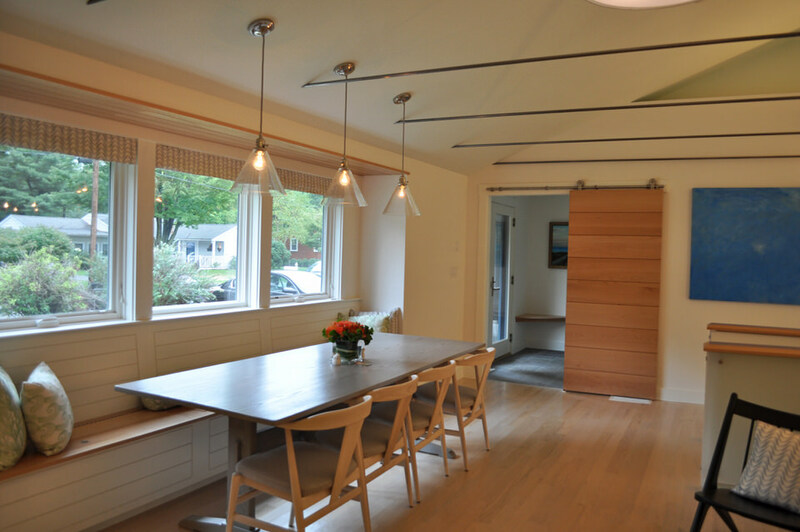 When closed, the doors provide a neat backdrop for the rest of the semi-open living space. Of course, books are well suited to built-in storage. Here, we combined books with a window seat (textiles by Oliveira Textiles), and concealed some base storage with doors and drawers fitted with pulls we reclaimed from the original ‘60’s ranch house décor and repainted . A table served by a banquette like this one, built into a window bay, can accommodate a crowd in less space than a conventional table surrounded on both long sides by freestanding chairs. A banquette can add craft, scale, and intimacy. Those of you familiar with my book The New Small House from The Taunton Press will recognize that this arrangement creates a “pocket for privacy”. This bench from the Touisset Small House, which is also featured in my latest book The New Cottage from The Taunton Press, is built into the side of an existing stair with the bench seat drawn from the height of the second riser. Bordering the kitchen, the bench is a convenient landing pad for guests chatting with the cook. The semi-solid slats of the stair guardrail provide a backrest, while a cushion and pillows by Oliveira Textiles add comfort. Built-in drawers beneath the bench provide bonus kitchen storage. 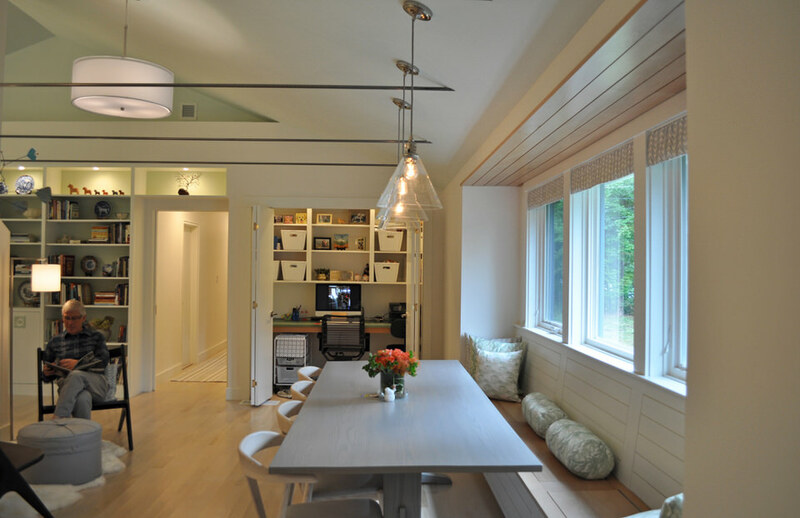 Not far from the stair bench built-in is a banquette built-in that allows for a dining area in a space that would otherwise be too small for a table with freestanding chairs on both long sides. This banquette has a more boat-like Craftsman aesthetic, incorporating painted finishes and brightwork. One last built-in banquette for you to consider. Find this one at the Harvard Shaker House. It has a somewhat lighter feel than the previous two, mostly because it’s open below. This client wanted to be able to sit with heels crossed beneath the bench, so the banquette is supported by a series of brackets. 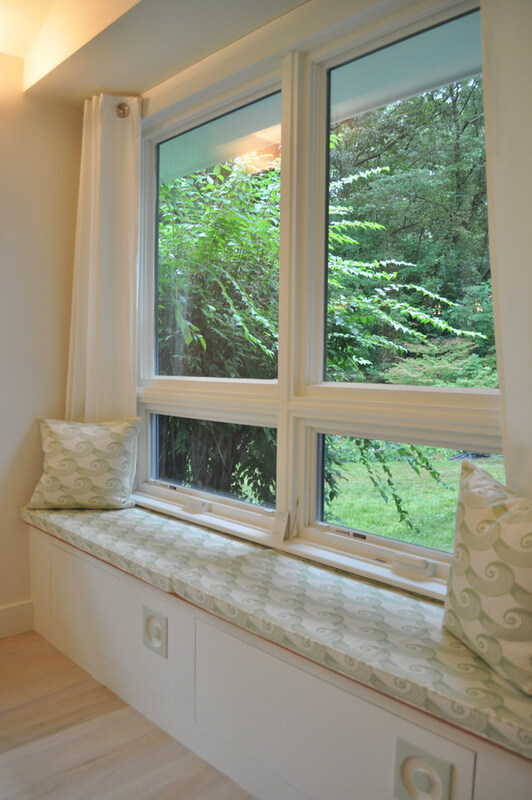 This banquette springs from a chair rail, has an angled back rest, and accommodates the window sill. As you can see, here at KHS, I enjoy designing custom built-ins that offer solutions while helping a project sing.